The “stars and bars” circular canton pattern with eleven-stars was used for First National flags from July 2, 1861, when Tennessee and North Carolina joined the Confederacy, until November 28, 1861, when stars were added for Missouri and Kentucky. The other side of this rare two-pattern configuration is a tribute to the “Bonnie blue flag that bears the single star,” the unofficial first Confederate flag. 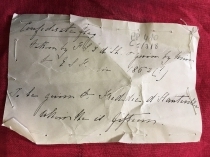 Frederic d’Hauteville’s small autograph note has been loosely stitched to the flag: “Confederate flag. Taken by F.S.G d’H. and given by him to E.S.F. in 1862(?). To be given to Freddie d’Hauteville when he is fifteen.” His first wife, Elizabeth Stuyvesant Fish, died in 1863. Freddy, his son by his second wife, was born in 1873, thus dating his note about the second gifting of the flag to between 1873 and 1888. The flag remained in his family, preserved in perfect condition, until 2015, when contents from their Swiss castle were sold, clearing the way for the property to be sold; it is now on the market for $60 million dollars. ELEVEN-STAR “FIRST NATIONAL” FLAG WITH SINGLE STAR “BONNIE BLUE” FIRST UNOFFICIAL CONFEDEDERATE FLAG VERSO. Belle Boyd, the “Siren of the Shenandoah,” gave the flag to Captain Frederic Sears Grand d’Hauteville on June 18, 1862, telling him that it was the flag she waived to urge on Confederate troops at the Battle of Front Royal a month earlier. D’Hauteville’s 25-page autograph manuscript war memoir, with his account of the gift of the flag quoted above, is included. (See below for complete transcript). With additional photographs and manuscripts. Homemade, perhaps even by Boyd or a family member, and used only briefly before being given to d’Hauteville, the flag has been perfectly preserved, retaining the short ribbons along its hoist and showing no tears, holes, fraying, loss, or staining. Over 5 x 3 feet. D’Hauteville had joined General Nathaniel P. Banks’ staff before Banks advanced south up the Shenandoah valley (the Shenandoah river flows north into the Potomac (at Harper’s Ferry), so you go “up” the valley to the south and “down” the valley to the north) to Strasburg, maneuvering against Confederate General Thomas J. “Stonewall” Jackson’s army. Belle Boyd had moved to Front Royal to stay with relatives when her hometown of Martinsburg, (West) Virginia, had been occupied by Union troops in March 1862. Shortly after her eighteenth birthday, Boyd hid in a local hotel in Front Royal, where she overheard General James Shields and his officers discussing orders to transfer his division to the Union army along the Rappahannock River in eastern Virginia. Boyd reportedly rode fifteen miles on horseback through Union lines to tell Confederate Colonel Turner Ashby of the reduced Union presence in Front Royal. When approximately 3,000 of Jackson’s men attacked the Union force occupying Front Royal on May 23, Boyd ran to meet Jackson’s men as they advanced, and urged them onward. The Union garrison, approximately 1,000 strong, under the command of Colonel John R. Kenly of the Union 1st Maryland Volunteer Infantry, was routed. Kenly was wounded, and he and nearly 700 of his men were captured. Jackson later sent Boyd a note of gratitude for her role. Robert Gould Shaw (1837-1863), another officer in Banks’ command, confirmed d’Hauteville’s account. In a letter to his mother, Shaw wrote, “Perhaps you have seen some accounts of a young lady at Front Royal, named Belle Boyd. There was quite a long and ridiculous letter about her copied into the ‘Evening Post’ the other day. I have seen her several times, but never had any conversation with her. Other men who have talked with her, tell me that she never asked for any information about our army, or gave them the slightest reason to suppose her a spy; and they were probably as capable of judging as the correspondent who wrote about her. She gave Fred. D’Hauteville a very pretty Secession flag, which she said she carried when she went out to meet Jackson’s troops coming into Front Royal.” Shaw went on to command an African-American regiment, the 54th Massachusetts Volunteer Infantry, which obtained fame in the Second Battle of Fort Wagner at Charleston Harbor on July 18, 1863. Shaw died with many of his men that day and was immortalized in a memorial by Augustus Saint-Gaudens in Boston, and in the 1989 film Glory. 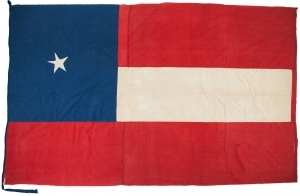 That both d’Hauteville and Shaw believed Boyd’s account that she waved this flag to encourage the Confederate attack, demonstrates her ability to manipulate both men and narratives. In her own entertaining (and exaggerated) memoir, Boyd later wrote, “As I neared our line I waved my bonnet to our soldiers, to intimate that they should press forward.” Another key witness, Henry Kyd Douglas (1838-1903), a member of Jackson’s staff, later recalled in his memoir seeing “the figure of a woman in white glide swiftly out of town” and that Boyd “seemed, when I saw her, to heed neither weeds nor fences, but waved a bonnet as she came on.” Whether she actually waived her bonnet, or this flag, or perhaps both at different moments during the battle that day, she clearly gave it to d’Hauteville to curry favor, and that apparently worked. Rather than being prosecuted for her role in aiding the Confederates in what was a disaster for the Union, she was celebrated for her charm. Before being banished to England, Boyd was arrested six or seven times, and always managed with the help of gentlemanly Union officers to avoid the most serious consequences. Her seemingly innocuous flirtations apparently provided her with her greatest source of influence. After being betrayed by a lover, she was arrested on July 29, 1862, and spent a month in the Old Capitol Prison in Washington, D.C. Exchanged a month later, she lived with relatives in the South for a time. She was again arrested in June 1863 while on a visit to her birthplace of Martinsburg. Suffering from typhoid fever, she was released on December 1, 1863, and banished to the South. While attempting to sail to England on May 8, 1864, she was arrested again as a Confederate courier. With the help of Lieutenant Sam Hardinge, a Union naval officer, she escaped to Canada, and then to England, where she and Hardinge married in August 1864. While in England, Boyd had a stage career and published a highly fictionalized two-volume work entitled Belle Boyd in Camp and Prison (1867). She died in Wisconsin while touring the western United States, telling her story. Frederick (or Frédéric) Sears Grand d’Hauteville (1838-1918) was born in Boston, Massachusetts, to a Swiss nobleman and American mother, who returned to the United States while pregnant. Their marital conflict led to a contentious custody battle over Frederick in 1840 in a Philadelphia court, which his mother won. D’Hauteville graduated from Harvard University in 1859. He was appointed volunteer aide-de-camp to General Nathaniel Banks in December 1861, and served at the Battle of Winchester in March 1862. Commissioned captain on June 30, 1862, he served on General Samuel Crawford’s staff, including action at Cedar Mountain in August. At the Battle of Antietam, in September, his commanding general was wounded in the leg while talking to him, and a few minutes later d’Hauteville himself was struck by a musket ball that was deflected by his boot but still seriously bruised his leg but. By December, he returned to General Banks’ staff in the Department of the Gulf. He resigned his commission on March 1, 1863. He married Elizabeth Fish, daughter of Hamilton Fish of New York, in 1863, but she died the following year. In 1872, he married Susan Watts Macomb (1849-1928), with whom he had three children. She was the grand-daughter of Major General Alexander Macomb (1782-1841), general-in-chief of the U.S. Army from 1828 to 1841. Five additional brief notes, including one on letterhead marked “Newport,” are loose in the notebook. Most were written by d’Hauteville and two are initialed “F d’H.” This lot also includes cartes-de-visite of d’Hauteville and his commander, Major General Nathaniel P. Banks, and an albumen image of four officers who attended d’Hauteville’s alma mater, Harvard University, and served with d’Hauteville in the Shenandoah Valley in 1862 (from left to right, Major James Savage Jr. (1832-1862), killed at Cedar Mountain; Captain Robert Gould Shaw (1837-1863), killed at Fort Wagner; Major Robert Morris Copeland (1830-1874); Captain Henry S. Russell (1838-1905). These materials descended in the d’Hauteville family until sold in September 2015. The d’Hautevilles kept a home in Newport, Rhode Island, but they also lived much of the time at his family’s palatial estate overlooking Lake Geneva in Switzerland. Approximately 1,600 items from the family’s estate were sold. Having been cleaned out, the 30-room d’Hauteville chateau, built in 1760, and its 64-acre estate, is now on the market. Learning that Confederates had captured Front Royal, Banks retreated north to Winchester. There, he tried to slow Stonewall Jackson’s pursuit, leading to another lopsided Confederate victory on May 25. Fearing that Washington D.C. was exposed, President Abraham Lincoln ordered General John C. Fremont’s forces in western Virginia and General Irvin McDowell’s forces in Fredericksburg to converge and trap Jackson. The Confederates demonstrated against Harper’s Ferry on May 29 and 30, but General James Shields, leading the only division McDowell actually sent, recaptured Front Royal on May 30. Over the next week, as Jackson retreated, the opposing cavalries met in several small skirmishes. In battles on June 8 and 9 at Cross Keys and Port Republic, Jackson repulsed Fremont’s and Shields’ armies and stopped their pursuit. After initially considering a counterattack in the valley, Jackson instead joined General Robert E. Lee at Richmond opposing General George B. McClellan’s Army of the Potomac. Although Jackson’s daring actions had threatened Washington D.C. and relieved pressure on Richmond, Union armies resumed their occupation of Winchester and Front Royal. Civil War Memoir of Frederick Sears Grand d’Hauteville, included with the flag. The notebook is bound in black leather, stamped in blind and gilt, with marbled endpapers and lined pages. Titled in manuscript “The War of Secession, 1861,” this memoir was written between 1887 and d’Hauteville’s death, clearly compiled from notes or a diary made during the conflict. The gilt decoration is still bright, and the leather and pages still fresh. The War of Secession, 1861. <2> I enlisted as “private” in the Fourth Battalion of Massachusetts State Infantry (Militia) at Boston Harbor, Fort Independence, in May 1861, & remained there for garrison duty and drill for one month. Afterwards drilled with the Battalion in Boston, during the summer and autumn of that year. Reported to Major General N P Banks commanding Fifth Corps, Army of the Potomac at Darnstown, Maryland, about November 20 1861 as volunteer Aid de Camp, without pay. Was appointed volunteer Captain & A.D.C. on General Banks Staff, on December 5, 1861. See General Orders no 70, Head Quarters, Banks Division. Darnestown, Md. Headquarters of the Fifth Corps Army of the Potomac, Banks Division, November 1861. Major General N. P. Banks, Major General Commanding. Major R Morris Copeland, Asst. Adjt. Genl. Major D. D. Perkins USA, Chief Inspector. Colonel S B Holabird, Chief Quartermaster. Colonel E S Beckwith Chief Commissary. Captain Aberd, U.S.A. Chief Engineer. Captain C S Best, Chief of Artillery. Colonel John S Clark A.D.C. Captain F. d’Hauteville Volunteer A.D.C. The Division left Darnestown, for Frederick City, Md on December 4, 1861 arriving there on December 6th. Quarters were assigned to me in the law office of Colonel Bradley T. Johnson of the Confederate Army. All law books and papers were carefully looked after by me. Friends made during the winter at Frederick City: General Shriver & family, & Colonel Maudsley & family. The advance of the Army of the Shenandoah into Virginia began on February 26th Head Quarters Staff left Frederick City on February 27, reached Harper’s Ferry on that day, & crossed to Virginia by pontoon bridge. Visit from General McClellan & staff on February 28th (Comte de Paris & Duc de Chartes ADC) accompanied by the Prince de Joinville. From Harpers Ferry marched to Winchester by Charlestown. Winchester occupied March 10. [Confederate General Thomas J. “Stonewall”] Jackson retiring down the Valley of <5> of the Shenandoah. March 22. First battle of Winchester (or Kernstown) in which General Jackson was defeated by General Shield’s Division. General Shields, wounded. The pursuit of Jackson by General Banks entire Army Corps began on the following day, by main road, passing Cedar Creek. First camp at Strasburg. April 1st advanced from Strasburg to Woodstock. Artillery duel, Cothran Battery. Bridge at the narrow pass saved, then, on to Edenburg. Bridge burned by enemy. Rebuilt next day by Pennsylvania men. Very heavy storm. April 17th Pursuit of Jackson resumed, reached Mt Jackson, General Shields Division leading. Next day to Newmarket, frequent Artillery duels, & rear guard & advanced guard skirmishes & picket firing. Lovely country. May 5. Started on return towards Strasburg after many reports of impending battle with Jacskon, who report said, had been largely reinforced. Strasburg May 13. May 23. Colonel Kenly attacked & overwhelmed at Front Royal. The first news was received by me at Head Quarters at 4. P.M. General Banks was absent, but Captain Brown of the 2d Mass was with me at the time. May 24. Retreat commenced towards Winchester by Middletown, Newtown & Kernstown. May 25. Battle of Winchester. See General Banks Official Report. United States, War of the Rebellion Series I, Volume XII. Part 1, pages 550, 552, 606 (Personal notice of myself.) In this battle my attention was called to the very gallant conduct of a Confederate General Officer in leading his men (alone on horseback) over the Hill on the Federal right, to what appeared <7> certain death. After the conclusion of the war, I asked General Richard Taylor, whose Brigade fought on the Confederate side, if he could tell me the name of that gallant Officer. He replied very modestly that it was himself, and that it gained for him the rank of Major General. Banks defeated & much demoralized Army retreated in disorder to Williamsport & remained there until June 10. On June 10, the army largely reinforced, recrossed the Potomac & marched towards Winchester, through Falling Waters and Bunker Hill. June 18. Reached Front Royal, & met there the famous & very handsome, rebel spy, Belle Boyd, who gave to me the rebel flag, waving which, she led the attack upon Kenly in May. July 6. Advance again, passing through Chester Gap, Luray, Amissville, Little Washington <8> Sperryville, Gaines Cross Roads to Fairfax, Culpepper, August 4th. Although ordered several weeks previously by the War Department to report to General Crawford for assignment as Asst Adjt Genl to his Brigade, General Banks, short of Staff Officers, could not spare me, and he ordered me to remain with him until the Army reached Culpeper, and it was not until August 4 that I was detached from his Staff. Advanced towards Cedar Mountain on August 8 and crossed the Creek. During the battle, my blankets, strapped behind my saddle, were pierced by one ball making more than a dozen holes. The battle of Cedar Mountain was one of the most sanguinary of modern times having in view the numbers engaged and the losses sustained. It should never have been fought. The Commander of the Corps [Banks] was a political General without military experience or training & the plan of the battle was thoroughly bad. Nothing but disaster could have been the result & there was no co-operation from beginning to end. The right flank of the attacking Brigade, (General Crawford) was exposed to the fire of a largely superior force. No reconnaissance of the ground was made during all the morning, previous to the enemy’s advance, while the troops were lying idle, under arms, & there were no reserves. Any advantage which the Union Army might have temporarily gained was therefore lost in advance, before the battle began, as it could not be held. General Banks was afterwards charged by General Pope, the Commander in Chief, with disobedience of orders in forcing the battle. This accusation was unjust and was clearly an afterthought on the part of General Pope. As the Assistant Adjutant General of the advanced Brigade, these written orders were shown to me by General Banks and no question whatever arose in the minds of everyone who saw them in regard to their purpose & intent. They were worded as follows & taken down in writing, when they were given: “If the enemy advances attack him instantly, & be reinforced from here.” (Culpepper.) The enemy certainly forced the attack, to which General Banks replied, with disastrous results. The explicit orders were strictly obeyed but the disposition for the attack & the general management of the battle, could not have been worse. General Pope afterwards claimed that General Banks should have attacked only with his “skirmishers” & wait to be reinforced on the following day. The written orders cannot be twisted into such a construction as this. An instant attack against any advance of the enemy was ordered, early in the morning, in writing and it was naturally inferred that the necessary orders for reinforcements were arranged for, then. The 2d Regiment of Massachusetts Volunteers, one of the best in the whole Union Army, in General Gordon’s Brigade, was officered almost entirely by young men belonging to the leading families in the City of Boston. All of them were my friends, & very dear friends. Their loss was enormous, but they went to their deaths with sublime courage. There was no flinching there. The retreat began on August 11th & the <12> Brigade, reduced in numbers by exactly one half, reached Culpepper on August 12. August 18. fell back towards the Rappahannock. August 19. Brandy Station & Beverley ford. Sharp skirmish across the river & very heavy rain. August 20. Sulpher Springs. Very heavy shelling from Confederate batteries. Next day to Bealton Station by Fayetteville then Catletts. August 28. Kettle run. First day of second battle of Manassas. August 31. Burned by urgent orders, all wagons, including ammunition. Attack expected at any moment by overwhelming forces. It did not come. Passed through Brentsville & forded the Occoquan to Bull Run & Centreville. September 1st Battle of Chantilly. Generals Kearny & Stevens killed. The Brigade was on the extreme right of the <13> line & was not actually engaged. September 2. on towards Alexandria. September 4th Crossed the Potomac & encamped just outside of Washington on the Rockville turnpike. September 9. Advanced along the Rockville Road & encamped near Middlebrook. The 124, 125 & 128 Pennsylvania Regiments (new) were assigned to Crawford’s Brigade. September 10. Encamped near Damascus. September 12 General Crawford in command of Division. September 13 Crossed the Monocacy and encamped just outside Frederick City. September 16. Advanced during the day. Crossed the Antietam and encamped in fields just across the stream. Heavy rain at night. September 17. Under arms at 5. AM and advanced. Was very promptly met by very heavy firing from both Artillery & infantry. The battle in our immediate front had its ups & downs all day long & the Regiments became very much broken up & formations lost. General Crawford was with the old Regiments & I was with the new ones from Pennsylvania. About noon, when we were together under very heavy fire, & close to the enemy, General Crawford was wounded in the leg & a few minutes later a musket ball struck the calf of my leg but my heavy top boots stopped its entrance. <15> The leg however was very much bruised. Shortly before this, General Williams temporarily in command of the Corps, General Mansfield having been killed early in the Battle, gave an order for the Commanding Officer of a small Brigade which did not belong to his Command, to charge the woods from which we had just been driven back. I took the order under a very heavy fire, but the Commanding Officer very properly questioned the authority. To obey it would have been the destruction of his Brigade, without the slightest chance for success. Colonel Wilder Dwight of the 2d Massachusetts, & a very dear friend, was killed at Antietam. From the eighth of August when we marched from Culpepper en route for Cedar Mountain, until the battle of <16> Antietam, on September 17th, I had slept for four nights only, under any kind of shelter. The weather had been very wet & officers & men slept on the grass without shelter tents. Everyone was starved during Pope’s retreat as all supplies were cut off, & our principal ration was the growing green corn. I remember very well picking up a piece of “hard tack” dropped in the mud by a soldier & eating it ravenously. The horses from want of fodder could hardly stand. The result was a very severe attack of diarrhea which I could not shake off for many weeks. After Antietam, General Crawford’s wound obliged him temporarily to relinquish his command, & he ordered me to report to General Banks who was then in command of the Defences of Washington, to help me to recover from an attack of jaundice which the acute diarrhea had promptly brought on. General Banks assigned me to the task of passing upon all applications for furlough for the whole army around Washington. My offices were on the whole of the ground floor in the historic building which had served as Head Quarters for the General in Chief since the beginning of the war. It was a very arduous & responsible duty as the orders from General Halleck were very positive. No leaves of absence were to be given except upon Surgeons certificate that there was danger to life or permanent disability. I remained in Washington on duty for about a month. My dear Mother <18> my Grandmother & Mr Amory paid me a visit of a few days. In the early part of October, General Banks invited me to go with him as one of the Assistant Adjutant Generals in his Staff on a proposed expedition South, by sea, no one knew where. I accepted promptly, as General Banks paid me the compliment of asking me, first, before any other officer, to join his staff. The expedition was being fitted out in New York & the Head Quarters of the Command were located there. About October 15, General Banks paid an official visit to Boston, and I went with him. My dear Mother was then far from well, but upon the advice of Dr Warren I went back to New York as it was feared that by remaining with her & missing <19> the Expedition the worry & anxiety of my remaining near her, would very likely do her more harm than good. On the evening of November 29 Mr Frank Davis brought me a telegram from Boston telling me that my dear Mother was dying and that all hope was gone. I was able to catch the night train & reached her bedside very early in the morning. My darling mother was then unconcious & at half past nine on November 30, 1862, she passed away. About December 10, I returned to New York. General Banks Expedition having sailed I was ordered to report to General Andrews who was in charge of a number of regiments to be dispatched later on. While with him I had charge of sanitary inspection duty, among other things & I found that there was much irregularity which required correction. On January 5th I was ordered by <20> General Andrews to report at once to General Banks & I sailed for New Orleans by way of Havana. I remained at New Orleans for about six weeks, with nothing to do but office work & on occasion uneventful expedition up the Mississippi to Baton Rouge & elsewhere. My resignation was offered on March 1st & accepted as my Mothers death & the consequent urgency of winding up her estate & other matters called me home. I shall never cease to regret as long as I live, that I did not remain in the Army until the end of the war. Private, Fourth Battalion, Massachusetts State Militia, May 1861. Head Quarters Department of the Shenandoah, February to July 1861. Captain & Assistant Adjutant General N P Banks Commanding Department of Washington, September 1862. Resigned, alas! March 1, 1863. During all my services with General Banks from Frederick City to Culpepper, I always acted as his personal Aid de Camp. All his private & official papers & dispatches came under my notice & I occupied not only a very interesting but also a very responsible position on his Staff. During the retreat of General Banks <23> Corps from Strasburg to the Potomac, in the temporary absence of the Assistant Adjutant General, Major R. Morris Copeland, practically all the duties were performed by me, & I think, to the entire satisfaction of the Commanding General. Proof of this is forthcoming in the double offer of Generals Crawford & Gordon to accept the regular position of Assistant Adjutant General upon their Staff. Both of these Generals had recently been appointed to the command of Brigades in General Banks Army Corps & both were present during the retreat. During all the spring months I alone in all the Army Corps was entrusted with the Government Cyphers. During General Pope’s retreat, I was one day sent for by Generals Pope & Banks, to <24> put into cypher a very important dispatch to General McDowell, with whom direct communication had been cut off by the enemy. My offer was accepted, but while <25> the instructions were being prepared, the advance of General McDowells Corps came in sight, & I was relieved from a duty which would have put me in the greatest danger of capture or otherwise. The 2nd Massachusetts Volunteer Infantry suffered 173 casualties of fewer than 500 men present at the Battle of Cedar Mountain. Sixteen of its 23 officers were killed, wounded, or taken prisoner.